Strong enough for a block of wood, yet balanced enough for a wine glass. Humans might be more enthusiastic to work with robots if they knew they wouldn’t be crushed to death in their cold metallic hands. 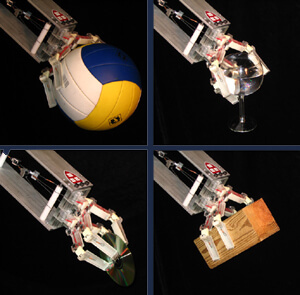 Well, researchers at Harvard and Yale have developed the SDM robotic hand which is gentle enough to hold a glass of wine. In fact, it’s neither cold nor metallic, being formed out of soft and hard polymers. Early in September, the SDM hand was licensed by Barrett Technologies, we discussed their WAM robot earlier, and could see sales as early as 2011. Developer Prof. Aaron Dollar is also working with Honda Research Institute to get the hand integrated with Asimo. Check out the teleoperated robot delicately grasping objects in the video after the break. Robots already have a successful history of handling repetitive tasks in industrial environments as seen with Motoman, Flexpicker, Kiva, and others. As robots move into more delicate and varied tasks, however, they need to be able to mimic the controlled and soft grip of the human hand. Aaron Dollar isn’t the only developer exploring this concept. We’ve already seen how Rodney Brooks and Heartland robotics are likely planning to turn a soft-handed robot, Obrero, into an industrial staple. Precise handling, and not just mechanical stamina, are set to help the new kind of robot find a broader niche in manufacturing. Adaptation of these hands could hold promise for creating more responsive and user friendly prostheses, one of Dollar’s other projects. If humanoid companion bots are ever to be produced they will also need the kind of hands that his team is aimed at perfecting. Typical robotic hands aim for complete control of its digits. Impeccably placed sensors and actuators manage the minute control of the device. Even other gentle robot hands, like the Obrero, have complex systems of movement. Yet the SDM hand is profoundly different. Aaron Dollar (Yale) and his former advisor Robert Howe (Harvard) designed the hand to work with a high tolerance for mistakes. There is just a single pulley-like actuator to control the four fingers. Watching the video you can see how the simplified approach lacks a uniform way to apply grip, but still works very well. We should take a moment to explain how the SDM hand gets its name. Shape Deposition Manufacturing is a technique wherein important elements (sensors, springs, actuators) are placed in molds. Then, using alternating series of material deposition and machining, a device is formed around the elements. SDM allows Dollar’s hand to have compliant joints and be formed out of a combination of soft and hard polymers. Shape deposition manufacturing produces flexible polymer based joints for the robotic hand. While the SDM hand is teleoperated in the video, that video is also originally from 2007. It’s unclear to me how far Dollar and Howe have progressed with independent functions for the robot. Certainly the interest from Honda and Barret would indicate the hand is on its way to be successfully used without human guidance. The SDM hand is still a young robot and Aaron Dollar is still a young professor. We are likely to see both develop further in the upcoming years. Check out the depository for robotic curricula that Dollar runs called Robotics Courseware, it’s a good resource for seeking to better understand how to teach robotics. That sort of education is going to be at a premium as humanoid robots continue to transition into filling most of the active roles in manufacturing. I get the feeling that as soon as gentler, more versatile robot limbs are perfected their first task will be shaking hands with the human laborers they are replacing.